Batman and Spider-Man operate in different fictional universes. Duh. But this summer, both heroes find themselves fighting the same enemy, the Dreaded Origin Reboot, in different mediums. Some of the critical reaction to The Amazing Spider-Man has wondered why moviegoers need re-imagining of Peter Parker's superhero coming-of-age. The Amazing Spider-Man Film is… Well… Amazing! It's only been ten years since Tobey Maguire starred in the first of Sam Raimi's wall-crawling movies. Do we need another take? I personally feel like the answer's no. And I feel the same way about Batman: Earth One, now that the long-brewing DC Comics graphic novel is finally out. Over 70 years, scores of writers have added to or reinforced the best moments of Batman's origin. A childhood discovery of a massive cavern underneath his home, training by ninjas, targeting the rich elites of Gotham… all of these are elements that embraced after being introduced in different instances. Much of that gets jettisioned in this new book and part of the hook here is showing up to see what's different. Johns writes like a man who knows the DC Universe mythos inside and out. He does, of course, having written several of the publisher's highest-profile characters and at least two of their continuity-rebooting events. There have been dozens, maybe even hundreds of pop psych interpretations of what could make a man like Bruce Wayne tick and this version seems modeled off of the narrowest of those. It's come up that Batman is essentially the construction of a spoiled kid who couldn't cope with loss and Johns makes young Bruce exactly that. The Earth One Batman doesn't seem to hear the higher calling of altruism that can coincide with his mission of vengeance. That realization only comes when Batman finds that the man he thought had killed his parents is innocent of that crime, leaving the true culprit out in the world. That's the subtext of previous versions of Batman rising to the forefront in Earth One, slammed home in pretty heavy-handed fashion. Gary Frank's art lives up to the other excellently detailed and highly emotive work the artist has turned out in his career. 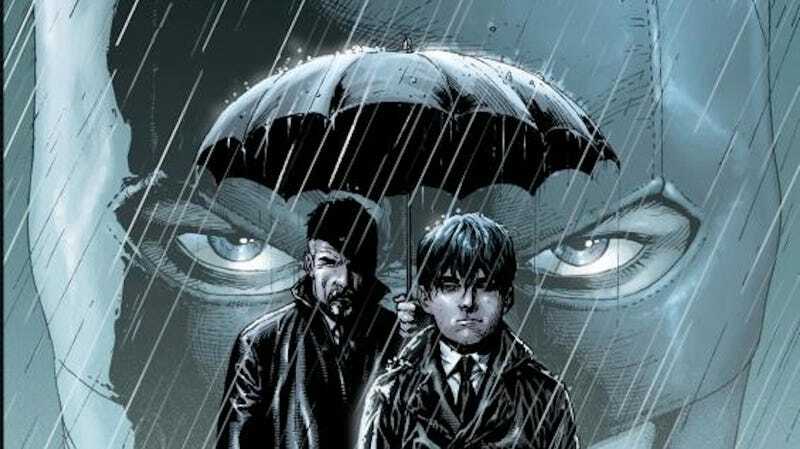 The anger and anguish on Alfred Pennyworth's face, the fear in a criminal's body language and the fury in young Bruce's eyes all come through with incisive skill. There's too much loudness and not enough quiet in this take of Gotham's guardian. Even the silent sequences feel like they're screaming for attention. Granted, readers are seeing a Bruce Wayne that hasn't yet learned the art of mystery. But, more problematically, it feels like Johns hasn't either. Almost every time you see a familiar character in Earth One, Johns has done something to subvert previous iterations. So Detective Harvey Bullock—a drunk, overweight self-destructive slob in the mainline DCU—is handsome and ambitious TV cop in Earth One. James Gordon gets similarly tweaked and readers used to seeing him as a ramrod straight law officer get something different here, too. Some of these moments work and others—like where Batman punches Gordon in the jaw at their first meeting—really only succeed if you have a previous attachment to the characters. When it comes to Amazing Spider-Man, part of me wonders why Marc Webb's film needed to change or recapitulate the origin at all. The major plot points of the film could have worked without tethering them to a new beginning. Peter could have just found his missing father's research, for example. Gwen Stacy could just be a new girlfriend. That kind of thing. A similar approach wouldn't work with Batman: Earth One. It's part of a new initiative to shed decades of confusing continuity and deliver a modern vision of DC's icons. But it's hard to see why someone coming fresh to Batman would want to read more comics after Earth One. There's a cliffhanger, sure. But this project doesn't hold any of the romance that's such a key part of the Batman mythos. Johns gets the darkness down pat but stumbles when it comes communicating that Batman can also be a figure of hope. It feels clumsy and cute, more concerned with upending previous understandings of Bruce Wayne and his supporting cast than with creating its own unique sort of Bat-resonance.